The M.O.P uses two wheel sizes. The Larger drive wheel, and the smaller caster wheel. There is a close relationship between the two wheel sizes and chassis ride height. A M.O.P chassis has fastening points for wheel braces and caster assemblies. Each of which can be varied depending on required ride height. If you don’t need a high ground clearance the braces and casters are configured to lower the chassis closer to the ground (reducing ride height). Small caster wheels can be selected and the main drive wheels can also be reduced in size. (Of course the trade off here is that you loose operational speed, but you gain torque). If you need increased ground clearance, larger wheels and taller caster assemblies are needed. 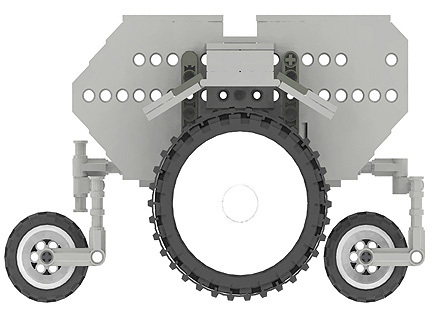 Both Caster and main wheel assemblies must be matched relative to their chassis mounting points. If not you get one very rocky rover, see sawing all over the place. Typically the M.O.P Rover uses a pair of LEGO Technic Motorcycle wheels & tyres with the addition of a Technic Tread wrapped around both tyre's perimeter. 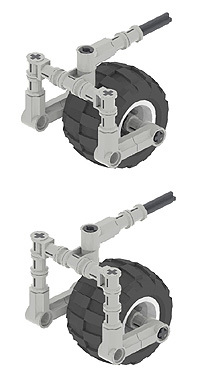 (The wheel design is based off Joe Nagata's wheel, tyre, and tread combo in his LEGO Mindstorms Idea's Book). Casters are a small LEGO Technic balloon tyre (43mm diameter). 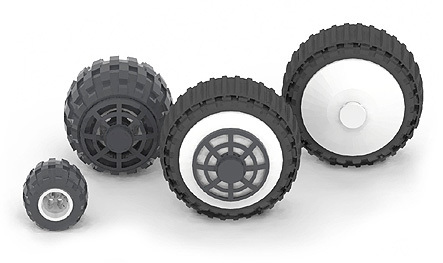 However different Rover configurations can call into use a variety of different wheel sizes.